A vintage Calthorpe 12/20hp touring car is purchased in 1926. Homepage. This page: Two items of paperwork refer to the part-ex of a Singer 10 car against a new Calthorpe tourer. Buying a new Calthorpe car in 1926. 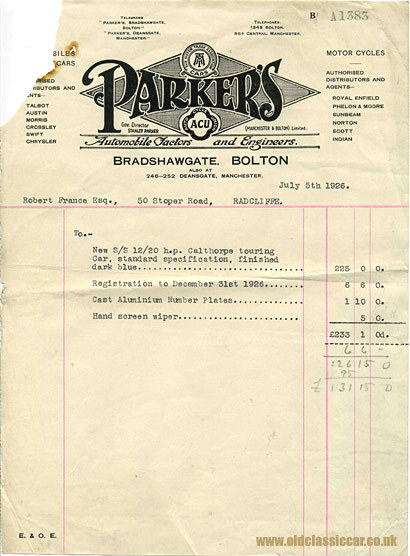 This is the second set of papers that once sat on the desk of Parker's Ltd (Automobile Factors and Engineers) of Bradshawgate in Bolton, and also Deansgate in Manchester to feature here. The other documents, for the sale of a Singer, date to 1924 and at first glance look to be of identical design, however some changes have occurred between 1924 and 1926 for this garage / dealership. The list of cars that they were authorised dealers for has been amended; Sunbeam, Singer, and Coventry Premier have disappeared from the list, to be replaced by Crossley and Swift. From the list of motorcycles, Triumph, Douglas, Matchless, Alldays-Allon and BSA have vanished. The company is now Limited also. The papers relate to Mr Robert France once again, and record the part-exchange of his 10hp Singer that he purchased from Parker's in 1924, for which £95 was allowed, against a brand new S/S 12/20hp Calthorpe touring car, finished in dark blue. Included was registration until December 31st 1926 (£6.6s.0d), smart cast aluminium number plates (£1.10s.0d) and the luxury of a hand-operated windscreen wiper, for which five shillings was charged, bringing the total to £233.1s.0d all in. A separate sheet of headed-paper records the part-ex of the Singer 10, and its valuation of £95.0s.0d. The Birmingham-built Calthorpe 12/20 was powered by a 1,496cc four-cylinder water-cooled engine, and produced from 1922 to 1932. A four-speed gearbox was fitted as standard. 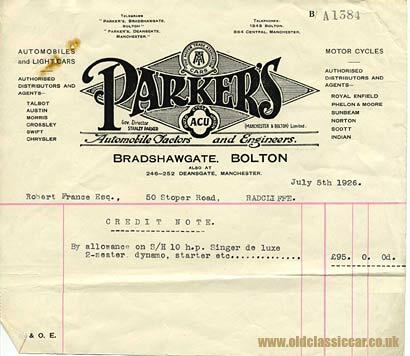 The new price for a 12/20 in 1926 is listed elsewhere as £295 for the two-seater, so perhaps Mr France received a discount at Parker's for his regular custom, his tourer coming in at £225 before extras. Later versions of this model were fitted with a larger six-cylinder ohc engine, displacing 1,991cc. Calthorpe produced its first car, a 10hp, in 1904, and continued selling cars until 1932, although few were actually constructed during the final years of this run. In fact in 1924 a receiver had been appointed to the Birmingham factory, and thereafter the number of new cars sold tailed off significantly. Perhaps Mr France's car had been sitting around in Parker's showroom for some time, hence the apparent discount this buyer received?